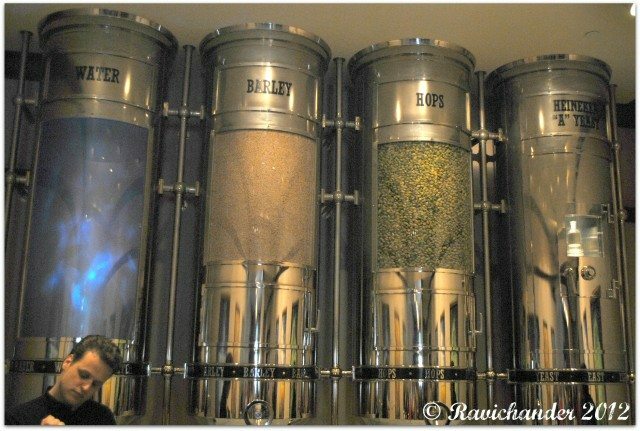 Alluring Amsterdam - Part 4 - Ghumakkar - Inspiring travel experiences. Day 3 ended with a luxurious pampering at the hotel spa. We got a nice ayurvedic massage done to completely rejuvenate the senses and we were treated with herbal tea to detox the body. Learning about us coming from India, the masseur put her best effort to satisfy us. She then asked for our honest feedback and asked us tips about how to improve! We being less informed about the nitty-grities of Ayurveda only gave her our heartfelt feedback and walked out being completely relaxed. Day 4 – our last day in the alluring city had to be spent well and the time had to be best utilized. So, we put on our thinking cap and chalked out a plan. We wanted to close the trip with something nice and different as an experience. So, we chose the Heineken Experience !! Have you ever heard about Heineken? I am sure most of us would have :) Atleast football fanatics will be aware of it! For my dear friends who are teetotalers and who are not so crazy about football, Heineken is a popular Dutch Beer. It is very famous in Europe and in most other parts of the world. If the information I have is correct, India imports this too – and its main outlet in India is in Mumbai (This is what an employee of the Brewery told us). 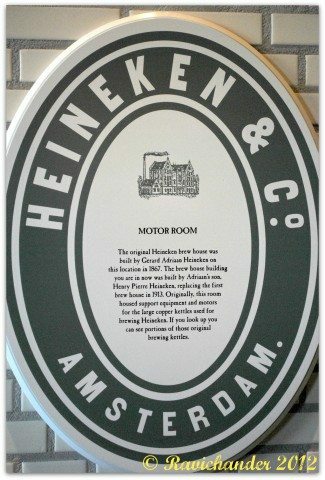 “The Heineken Experience” as it is called is a tour inside the Heineken Brewery which is located in the heart of Amsterdam city. With our Holland pass, we were able to exchange one of the coupons with a ticket to the Brewery. It was my first time experience in a Brewery and I was really excited. I was sure to be intoxicated by the experience! 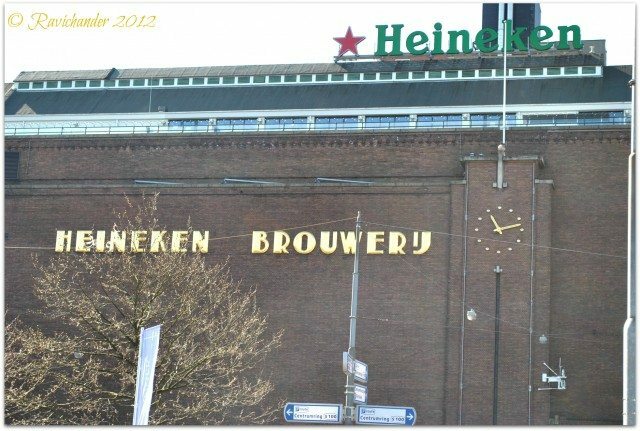 The tour inside the Brewery began with a 3D film on how Heineken became what it is now! Projected on the wall of the brewery, I honestly felt it was a great start of the tour. As we walked inside the brewery, we saw huge interactive displays about the awards and honors which Heineken has bagged over the decades. The old barrels used to store beer is still among the displays there. 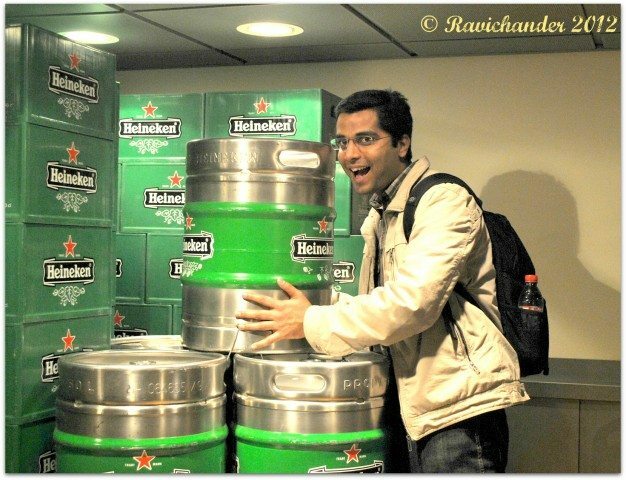 Soon, we came to a hall like area where huge containers containing the vital ingredients of the fine quality Heineken Beer were stored. The 4 ingredients of the secret recipe are – Barley, yeast, hops and water! The taste of the beer comes from the hops which adds bitterness to it. 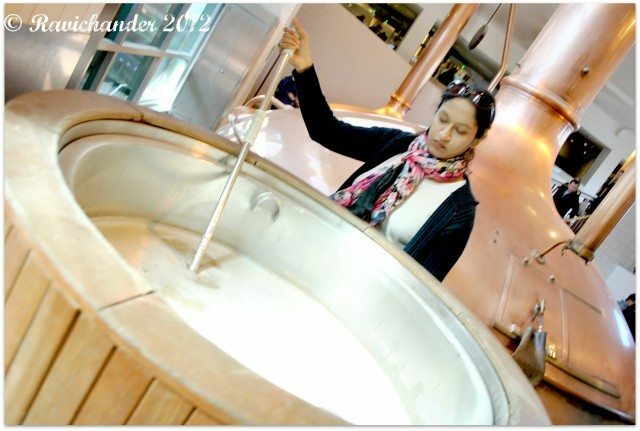 The brewing process was briefly explained here but for further details, the brewery itself was there for us to explore! We walked past huge structures – each of which depicted a stage of the brewing process. At one point , we were given a sip of the barley malt – which was still not fermented and hence alcohol free. This can also be tasted by children since it is just malt and is found to be medicinally good. A little while later, we joined a crowd which waited for the “Brew you” ride in the brewery. The name instantly piqued our interest and we dint want to bypass this crowd to proceed further. We were sure it would be something funny with ofcourse some information too. When our turn came, we went inside the “Brew you” room. The Brew you room appeared to be like a 4D effects room at the first glance. Without trying to imagine anything, we stood there to just enjoy it. The instructor asked us to hold the bar in front of us tight and to keep all our electronic items safely inside. They warned us of these items coming into contact with water. Now, my imagination could not stop itself from running wild – will we get dipped in some cauldron? Will we have showers of beer? Will there be a splash of malt on us? What is it going to be like?? What adds more joy in this tour is the multiple stops to have beer :) At the last point of the tour, we could have 2 mugs of beer OR for teetotalers like me, there was Coke served – i.e. on exchanging the tokens on the wrist band that they had given along with the tickets. Surprisingly, we saw a lot of people taking Coke and not beer :) Does it speak of the quality? No!! These are people like me, who had won themselves a lot of Beer in the Q&A session at the previous point! We had lunch at a nearby restaurant and then grabbed a huge hollandish frites pack with mayo, onions and ketch-up. We sat by the side of the busy road and watched the people and enjoyed the music by some street artists. With the day moving towards dusk, the curtains of the trip was lowered. Nice post Archana. 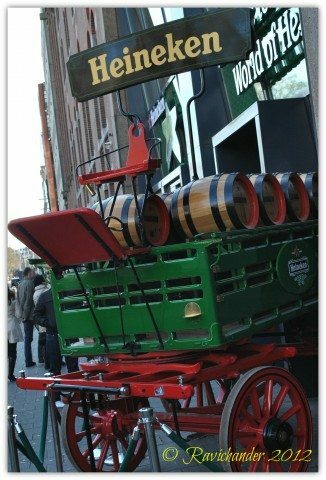 A guided tour in the world famouse Heineken premises itself a memorable experience for any travellers, whether he or she loves beer or not or the first timer like you. Thanks for the comment :) It was indeed a memorable trip and a great first experience of beer tasting! 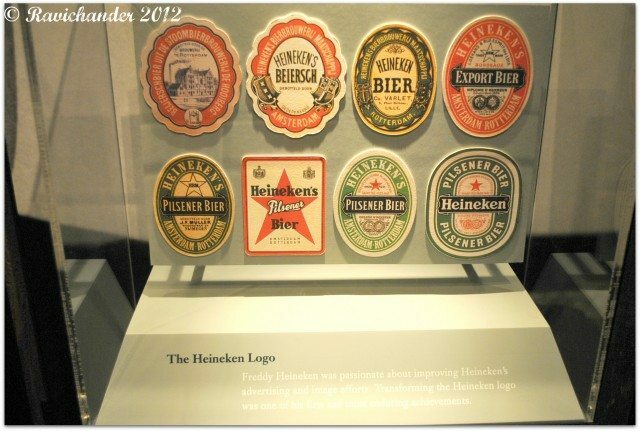 �The Heineken Experience� very nice description and good photos. Heineken is also popular in North America. Thanks for your comment! And yes, I heard from a few of my friends too.. About Heineken being popular in North America. Heinken is now avail here, though still imported I guess and hence very expensive. I wonder why Kingfisher is not doing something like this ? 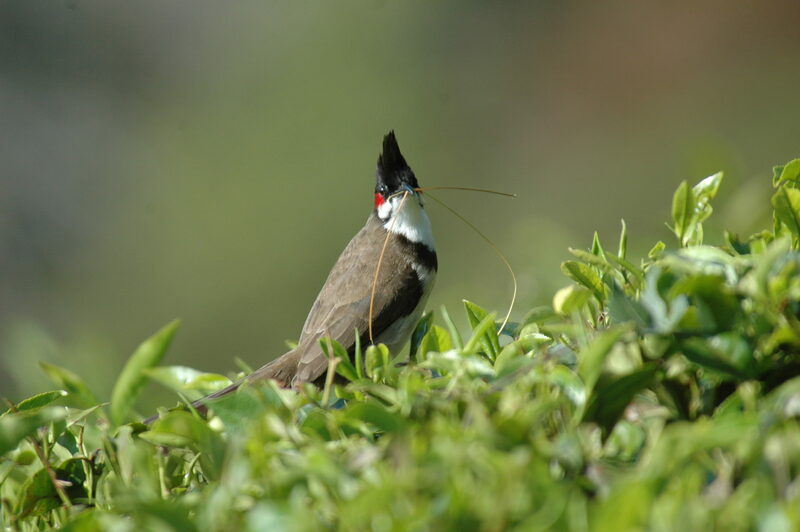 They are hugely popular and everytime I am with someone coming to India, they would want to have KF only. Great log and great pics Archana. Men gulp, not because to avoid bitterness, but to have as much in as little time. He He. By the way, there was a 4-D theatre in Noida which got shut down. I was there few times (mostly free) and liked it with moving seats, air brushes, water sprinkles and what not. Thank you very much to you and Ravi for sharing this series with us. Very interesting read. Although I am a teetotaler, but I like the way you narrated the whole experience at the brewery. We froze a mid week day 8:30 pm slot for our telephonic conversation. After a tiring day at work, would the person have mood to give an interview? Well, I was really skeptical about it. TO add to my apprehensions, the phone rang for longer than expected rings. I cut it and redialed again. Now, the network provider shooted an automated message “The person you have called has redirected calls to another number. Please hold on as we connect to the other number” and some “melodious” tune to keep me happy waiting  Well, I thought I would try once last time and then send a mail to reschedule the interview slot. But, there is always light at the end of the tunnel! A friendly voice answered the call. What happened next is spread on the table for you readers to relish!